Advances in technology in domestic hot water delivery are worth a fresh look. 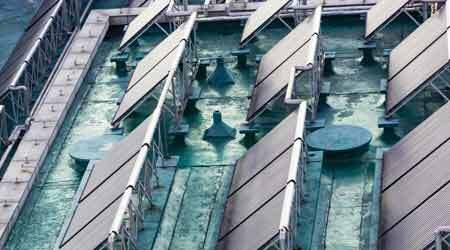 Solar thermal water heaters are a mature technology that is worth considering in many facilities. In the never-ending quest for effective reductions in energy use, facility managers often tread lightly when it comes to innovations in domestic hot water generation and distribution. Most users have little tolerance for deficiencies in domestic hot water delivery or temperature. Domestic hot water is a critical service in sensitive applications such as healthcare, restaurants, hotels and motels, fitness, laundries – the list is long. There is zero acceptance for failure of any kind in such facilities, and facility managers are much less likely to try new ideas until they’ve been proven. As a result, although there have been significant innovations in commercial domestic hot water equipment and methods in the last two decades, uptake has been slow. That means facility managers are often missing opportunities to save energy using mature technology. So it’s worthwhile for facility managers to understand the proven options available today. The most popular domestic hot water heater in use for medium-size commercial applications continues to be the direct-fired fire-tube storage tank type, using either gas or oil. They are relatively inexpensive, simple, and very reliable, and they provide a large volume of stand-by storage — up to 120 U.S. gallons per tank — for instant response to small draws of hot water while providing ample supply for large but short duration intermittent “dump” loads. Commercial tank-type water heaters normally have much higher energy inputs than their residential counterparts to allow for faster recovery when depleted or provide for continuous draws at lower volumes. These tanks are easily combined in multiple banks — typically up to four units — which provide redundancy and increased capacity at the same time. This method is popular in critical service applications such as nursing homes and smaller hotels and motels because of the reliability provided by multiple units, but equipment tends to wear out quickly. Many tanks fail within ten years, so it is important to budget and plan for a regular replacement schedule. Ensure ample space in mechanical rooms and provide them with easy in and out access to allow for rapid and stress-free renewal. Some highly efficient, direct-vent condensing models are available and are recommended in any new or retrofit application. In the conventional “base” models, incremental energy saving enhancements have been added over the years, such as vent dampers or power venting, electronic ignition and better burner technology, but increases in efficiency have been modest. Boilers: An Energy-Saving Option for Heating Water?